Daft.ie is Ireland’s most popular property rental portal. It’s self-service advertising feature allows sale, rental and sharing ads to be placed when you’re selling or looking to rent out a property. You can renew an ad on Daft.ie once a day. This renewal is effectively confirming that the property is still available, so the ad behaves like a new listing and is pushed back to the top of the search results. Over the course of the day other advertisers will also place new ads and renew their existing ones. This constant churn means that the ad which was renewed at 9am to go top of the listings is very unlikely to still be there come 9pm. Ads at the top of the search results will generally get a much higher response rate than those further down the listings, so the longer an ad remains towards the top of the listings, the better it performs in terms of views, phone calls and ad replies. As a result of this, one question we often get asked is “what’s the best time of day to renew my ad?”. The Daft system handles well over a million email replies per year. We can look at the stats from these replies to work out at what time most replies are being sent, and consequently what is the best time for an ad to be at the top of the listings. 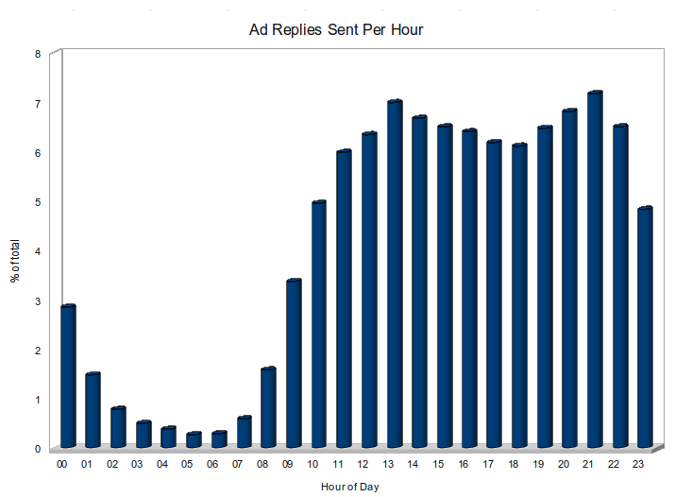 The above chart shows what percentage of ad replies are sent out on a typical weekday. This graph mirrors Daft’s general traffic pattern quite closely – quite busy from Monday to Wednesday, getting quieter through Saturday, then starts to pick up again on Sunday evening. What this means is that an ad at the top of the listings on Monday or Tuesday is over twice as likely to get a reply as an ad in the same position on a Saturday! 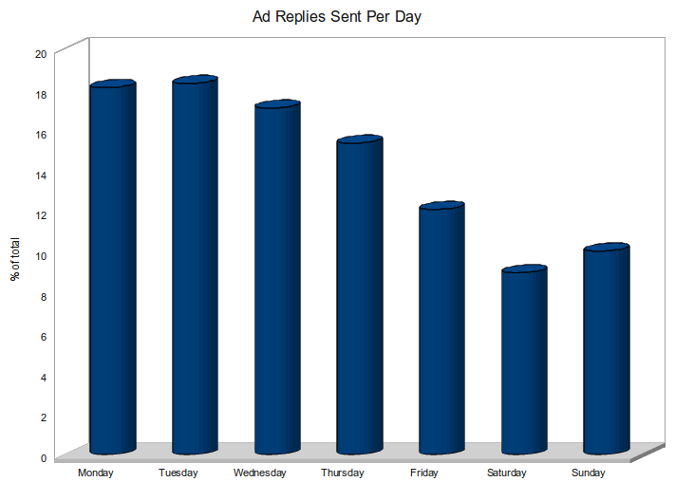 Knowing which days are most likely to yield ad replies is a good start, but as an ad can only be renewed once a day, reply volume over the course of a day is the next thing to check out. The two peak times over the course of a typical day are around lunchtime (1-3) and then again in the evening from 8-10. An ad which is at the top of the listings at 1pm is almost twice as likely to receive an enquiry as an ad in the same spot at 9am that morning! So from looking at the table and charts above, it appears that the ads which perform best are those at the top of the listings on Monday and Tuesday evenings, from 8 to 10. So, timing the renewal/entry time of an ad can be quite an important part of extending an ad’s reach to the widest possible audience! Once an ad is at the top of the listings, it’ll get a lot more attention, but some ads will still perform better than others. The best way to ensure that the additional attention turns in to actual enquiries is to make sure that there’s a good, detailed description on the ad, and plenty of photos to look at!